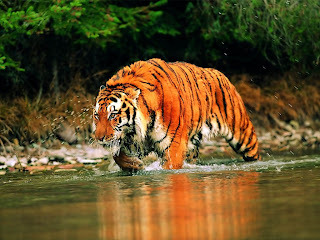 The Sundarbans is a United Nations Educational, Scientific and Cultural Organization (UNESCO) World Heritage Site covering parts of Bangladesh and India. The region is densely covered by mangroves, and is the largest mangrove forest in the world. It is also one of the largest reserves for the Bengal tiger. The Sundarban forest lies in the expansive Bay of Bengal delta. 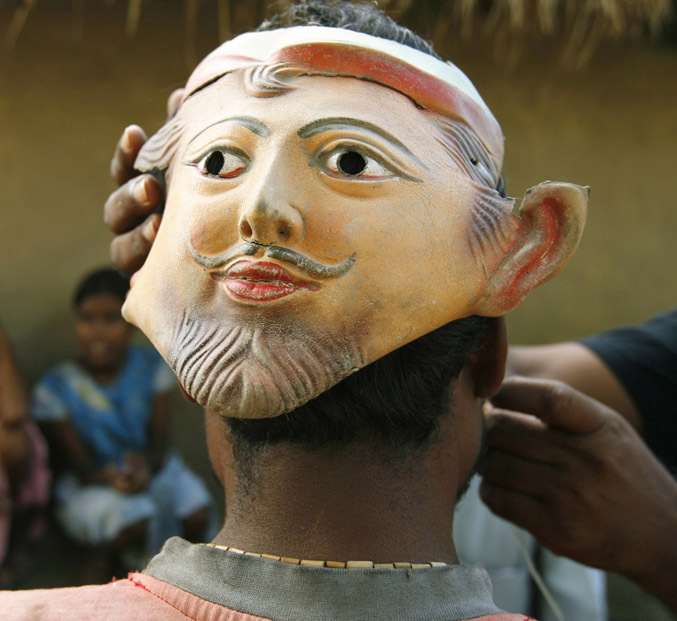 Inland from the mangrove forest lies the seasonally flooded Sundarbans freshwater swamp. The Sundarbans is estimated to cover about 4,100 square kilometers and serves as a protective barrier against cyclone flooding. A 2007 UNESCO report states that a likely 45-cm rise in sea level by the end of this century, along with other human-derived stresses, could lead to the destruction of 75% of the Sundarbans mangroves. 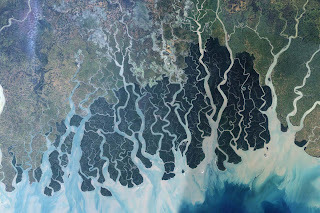 A satellite image of the Sundarbans. The Sundarbans is intersected by a complex network of tidal waterways, mudflats and small islands of mangrove forests. Almost every part of the forest is accessible by boat. The fertile soil of the delta has been used for agriculture for centuries, with the forested regions dwindling to about one third the size that it originally measured some 200 years ago. What remains, along with the Sundarbans mangroves, is an important habitat for the endangered Bengal tiger. Over the past century, the tiger population has fallen dramatically, and continues to decrease. Loss of habitat and poaching are the two most-serious threats to their survival. In 2006, the Indian government granted some of their most impoverished communities the right to own property in the forests, which brings them in conflict with the Bengal tiger. 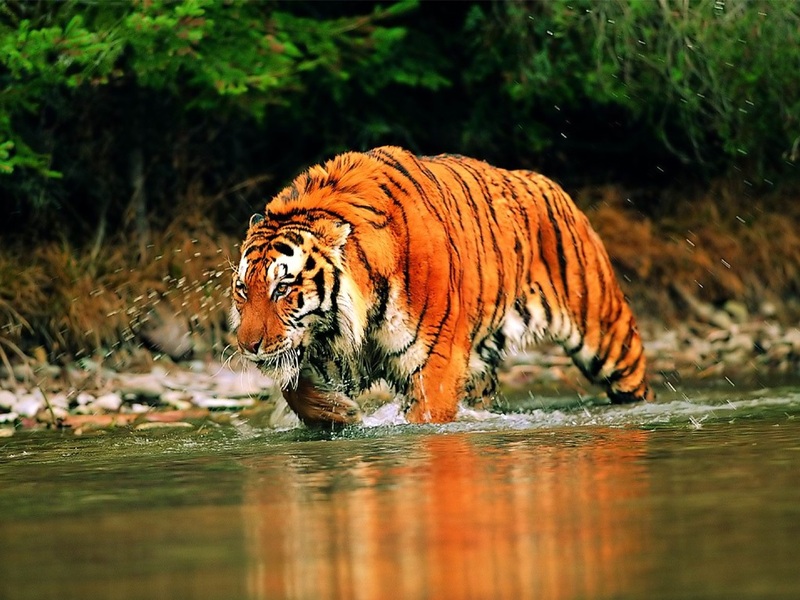 Tiger attacks in the Sundarbans kill from 50 to 250 people each year. Although precautions that were enacted in 2004 temporarily stalled the attacks, recently attacks have been on the rise. In 2007, Cyclone Sidr devastated the Bangladesh side of the swamp, depriving the tigers of their usual food sources and pushing them towards the more populated Indian side of the Sundarbans. Villagers tried wearing face masks on the back of their heads to confuse the tigers, which prefer to attack from behind. This worked for a while until the tigers figured it out, after which the attacks continued. Government workers wear strong padding on the back of the necks, similar to those worn by U.S. football players, to prevent the tigers from biting their spine. This is their favorite method of attack. Villagers in the area occasionally release livestock into the forest in order to provide an alternative food source for the tigers and discourage them from coming into the villages. The government subsidizes the project to encourage village participation. If you enjoyed this article you might also want to read my article on the Siberian Tiger Project.